Description: Fabulous county map of Devon with descriptive text in English on reverse. Inset plan of Exeter. Black and white. 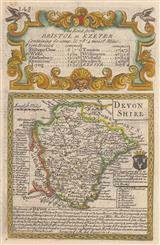 Description: Early county map of Devon with the Royal coat of arms of the United Kingdom presented to the upper left corner. Description: County map with original hand colour. Decorative cartouche and coats of arms. Description: County map from the Dutch Golden Age with elaborate decorations. Coloured. Description: Beautiful early county map of Devon embellished with ships. Coloured. Description: Attractive and rare map of Devon embellished with several ships and divided into Hundreds as listed on the lower right. Description: County map of Devon from the Dutch Golden Age in splendid original colour. 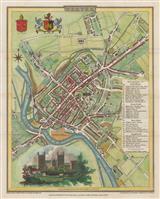 Description: Devon, highlighting cities and towns and with a decorative cartouche. Coloured. Description: Large, important county map in original colour set within text panels and with an inset of Plymouth. Description: Chart of the coast of Devon from Exmouth to Newton Ferry. Large vignette of William III landing in England. Description: Plymouth. Sea Chart of Plymounth Sound with an inset of Salcombe. Notable docks, buildings and settlements are featured. Description: Devon. Miniature county map. Coloured. Description: Attractive map of the county of Devon highlighting the developing road network during the Industrial Revolution. Original hand colour. Description: Copper-engraved city plan of Exeter featuring a vignette of Exeter Cathedral, as well as a numbered index to the city's houses of worship. Coloured. Description: County map of Devon noting the number of settlements and its hundreds. Original colour.